As a Trustee of Jnetics, Alan contributed enormously from the outset of the charity. His opinions, offered with his usual modesty and humour, helped shape the charity’s direction, and acting as an ambassador and a mentor he greatly helped progress our work. In spite of his struggle with Myeloma, he was constantly supportive, providing positive and valuable advice. Alan would have been very proud to see the first community screening take place in Feb 2014, delivered by Jnetics in partnership with GOSH and Guy’s Hospital. He fully appreciated the importance of screening and was keen for the charity to facilitate a service for the Jewish community that may also serve as a model for other communities in the future. Alan’s work with Jnetics offers but a small insight into the huge contribution he made professionally and personally throughout his life. He was a wonderful doctor who committed himself for 27 years to Newham General, to the NHS and to developing services for women. He was a dedicated teacher, passionate about medical education and humanising the experience of medicine for his students. 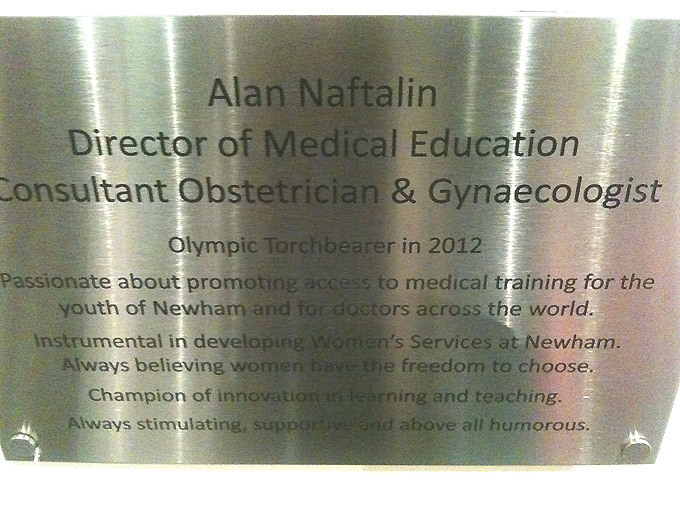 In appreciation of Alan after his passing, his unit at Barts Health NHS Trust was renamed the ‘Alan Naftalin Centre for Education’ (see the dedication plaque below). He served as secretary of the Jewish Medical Association and president of the Barts and Royal London Tennis Club as well as being involved in many other community activities. His interests were broad and always approached with great enthusiasm – he committed himself to languages, music, cooking, his allotment, his book group, and was an accomplished athlete. 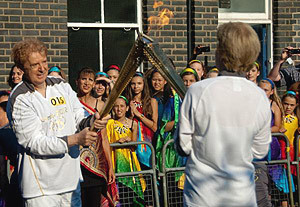 He had the deserved honour of being an Olympic torch bearer in 2012 – supported by his extensive family and many close friends. Alan was a kind and generous spirit, unpretentious, funny and wise. He was respectful and open minded and inclusive. His abiding concern was for others – and he very much loved by all that had the pleasure of knowing him. In his memory, Alan’s siblings kindly donated funds to support the set-up of the community screening service for which he was an advocate. The donation enabled an essential piece of laboratory equipment to be purchased and covered the costs of the initial genetic counselling provision.